Brad Evans and Travis Jensen . At 50 pages, Tenderloin USA is a black-and-white photojournalistic odyssey of discovery and exploration through one of San Francisco’s most vibrant yet often overlooked neighborhoods, the Tenderloin. 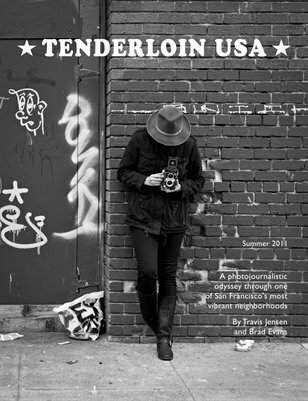 Authored by local photographers Brad Evans and Travis Jensen, Tenderloin USA takes readers on a photographic journey deep into the heart of the Tenderloin, with focus on the folks who live, work, own businesses, hang out, and raise families in the culturally diverse neighborhood. All Tenderloin USA proceeds in excess of printing costs will go to Larkin Street Youth Services, a San Francisco charitable organization that helps at-risk youth in the area.